Vijaya Dashmi, the symbol of victory of good over evil, has gone off the hood of festivity, and it seems the zeal has weakened among the wide span of people. Nine days of festive mood took the turn otherwise and led the grudge sprawl across the eastern India in form of cyclone Phailin. Other than the major devastation which the devil with more than 200kmph speed caused in Andhra Pradesh and Odisha, now decreased at the speed of 45-50 kmph is moving across Bihar and affecting the region with heavy rainfall. The end to these nine days of celebrations, bestowed with offerings in form of vrat and worship, will result into a dull day full of hopelessness in a closed room was never expected by me. 5 years back, those days when I was still in school, the zeal for Puja used to be different. The height of festivity was not only high for me, but I could sense that among the masses on the road too very easily. Time has changed now, interests have been manipulated. I roamed half of the Patna on Maha-Ashtami, but couldn't find the essence that still lingers at the back of my mind. Where has the honesty crept in? Why do the rituals at the front appear superficial on the thick coat of disguise? In the state/nation where the status of women is jeopardized, I am confused why so much of pom-pom for Durga Puja? 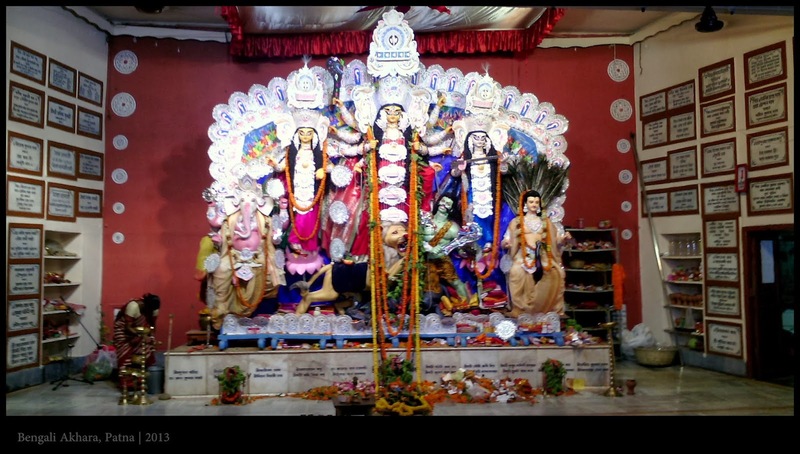 On Navmi ( the ninth day of Durga Puja), the devotee invites Kunwari Kanya (maiden) to feed them as a ritual which completes the nine days of worship. Whats the need for such a falsification outside, when no respect and dignity stays inside. Be it a regular day, or within the crowd of Durga Puja on the road, eve-teasing and illicit comments are very much common. The intentions in the eyes and glances itself tell the whole story. I pick up my previous notion and refine it a bit. ‘The Good is not left to the extent that it can win over the extolling Bad’. Electricity is yet to come. It’s raining hard outside. The laptop power I saved is almost over now. I pray everyone stays safe, and for them who suffered the blows of Phailin in Andhra and Odisha may get rehabilitated soon. I pray the mother to bestow kindness, and help us stay honest to ourselves. Similar experiences here. :( It was the dullest puja ever and the crisis I and my family member had to bear was truly disheartening during the auspicious puja days. Puja turned so gloomy this time. Prayers for those who suffered through greater losses. Yes Namrata, the puja ended with a disheartening note.